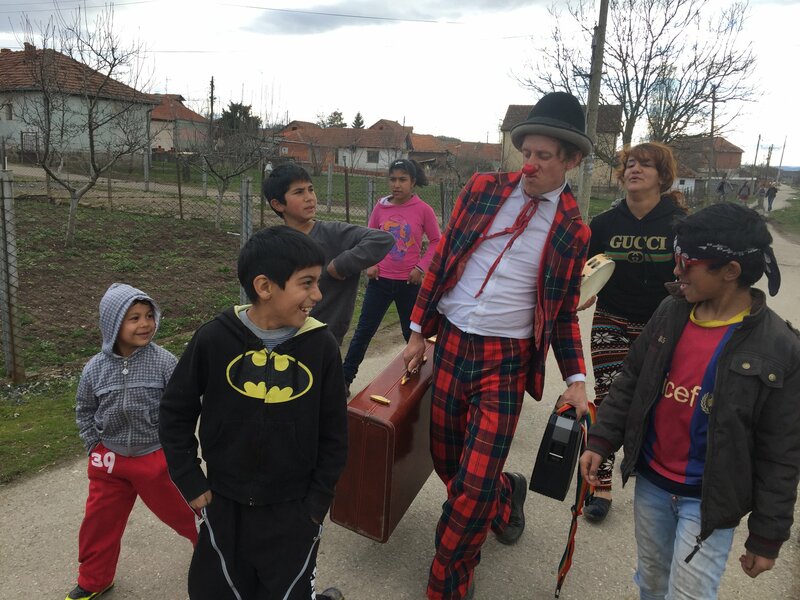 CWB – USA is revisiting the same Balkan Route (#refugeeroad) that it traveled in 2017, deepening the relationships we formed a year ago. Veteran CWB performer Sabine Choucair describes the second week of performances and a very special little boy. Today, we take a ferry and then drive hours down a dirt road, reaching a forest where a group of men have spent between two months and two years trying to cross the border. 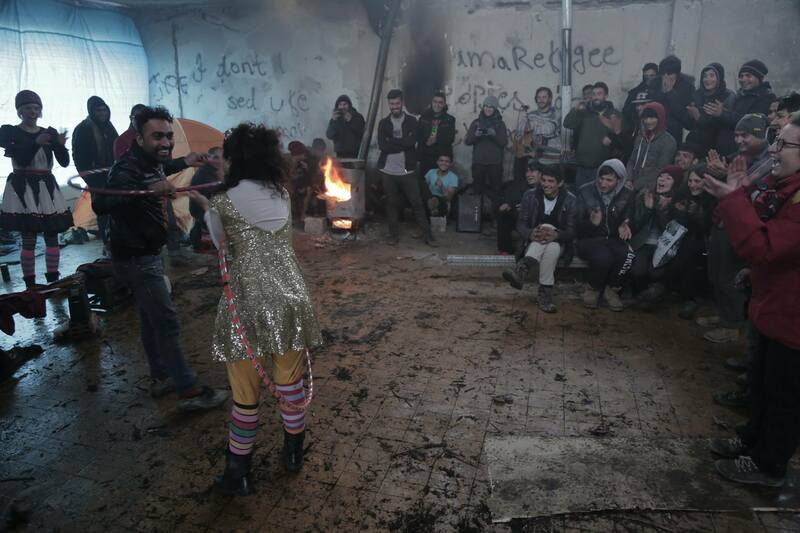 We perform in the middle of nowhere, in the woods, under the roof of an abandoned building where these guys shelter on cold nights. On the way out, I’m clowning around and ask one of the men for his papers. “Which ones?” he says. “Would you like to see my Serbian passport? My Bulgarian one? Or my Afghani one? I have all of them scanned and ready.” He has a smile on his face and a lot of anger and sadness in his eyes. We start off at a camp where the kids have an urge to just hug and hug, and never let go. A little boy approaches me and touches my leg, opens his arms and looks up! As soon as I hold him tight he hugs hard and gives me so much love that we both struggle to let go of each other. The same thing happens with other kids at this specific camp in Serbia. I’m not sure why, but I cannot be thankful enough for these moments in life. Later, we drive for hours to reach another secret spot where refugees prepare themselves for the game. I like that they call trying to cross borders a GAME! The best moment comes that night. At 8:00pm, it’s pitch dark and cold. We take a dirt road for 20 minutes, driving in a van owned by a lovely volunteer dedicating his time to helping people in the woods. We arrive, and there’s no sound whatsoever. No one is there. Then the volunteer whistles, we start our music and people start showing up from everywhere, from their hidden spots. The calm, sad, cold place in the woods becomes so alive, filled with laughter and joy! 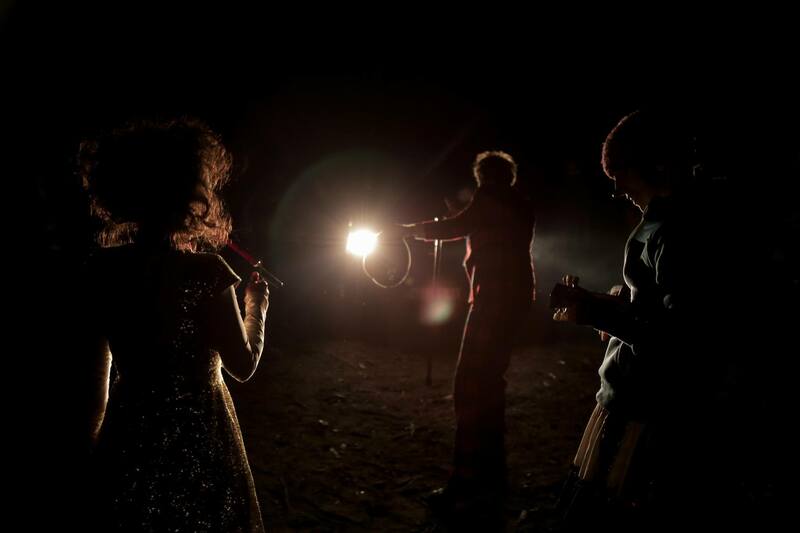 We perform, using the headlights of the van, and the forest takes our noise across borders. “Miss Sabine, you can go anywhere you like with the car, but not to Kosovo—it’s very very dangerous! Your license plate is from Serbia!” So says the guy who works for the rental car company. It’s 6:00pm, and we’re 15 minutes away from the border. Funny how we are always afraid of the “other”! We head back to Presevo-Serbia, where we had just had an amazing performance a few hours prior to the license plate incident. In the span of 40 minutes, Jeroen Wils, one of the our local partners, finds us a safe place to park the rental car, hires a driver and helps us cross into Kosovo. I will spare you the details of border control and the surprised faces of the policemen, as they watch a Belgian, an American and a Lebanese person cross the border with hoops, clubs, a sequined dress, wigs, a weird Chinese medicine that you burn and put on your forehead, and a dinosaur finger puppet hidden in a jacket. The following day, I feel like I’m living in an Emir Kusturica movie! We meet an old Roma woman who’s missing half her teeth—but of course, one of the remaining teeth is made of gold! She finds Justin Therrien and me to be very exotic and asks for pictures with us. It’s a sunny, calm and cold day, and the air smells like burned rubber. A goat is chilling in front of a house, a small dog is eating another tiny dead dog. Clothing lines are hung everywhere, in front of houses made of hay, or clay. We don’t see many people, and it’s very quiet. So of course, we go for a parade with live music and happy clowns! Roma kids, with colorful clothes, winter boots, stunned faces and running noses, unlike what I’m used to, come slowly towards us. Maybe they’re a bit skeptical? But they shyly enjoy the bubbles and the magic tricks. We all go to the performance space together, and start the show with a few people watching. By the end, there are way more people and a much more festive feeling. We leave with louder sounds and happier faces. Some of the kids take musical instruments and play and sing while taking us back home. One local who volunteered to be in the show is a male cross-dresser who is, apparently, respectfully accepted in his community. Long live the Roma people! I’m happy to be in such “dangerous” places all the time, any time. Please take me back!